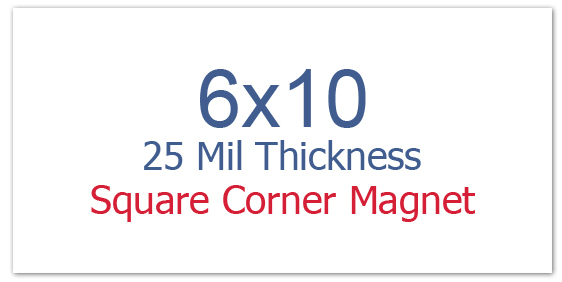 Promotional 6x10 inch printed square corner full color magnet – 25 mil makes a very favorable promotional choice for advertisers planning to ensue long term indoor marketing. This magnet possesses larger shelf life than a regular 20 mil magnet because it is produced from high quality magnetic material. Advertisers who have extremely high expectations from their campaigns can employ a custom 6x20 inch printed square corner full color magnet as a calendar magnet, announcement token, etc. A personalized 6x 10 inch printed square corner full color magnet can be handed out during any promotional campaigns or it makes a good gifting choice during any family or social events, wherever large turnouts can be expected. Creatively manipulated printed square corner magnets stand high chances of retention over simpletons, thus giving much higher benefits to advertisers.